Dropbox CEO Drew Houston talked a big game this week when he announced new ways for apps to save and load user data. More than just a set of developer tools, Houston billed the new Dropbox Platform as a way to “replace the hard drive.” Dropbox Platform is supposed to provide easier ways to store your files in the cloud, with simple buttons that developers can add to their apps. It can also let apps save their own data across platforms, so your work in an Android app can carry over to iOS, and vice versa. Houston’s grand proclamations certainly made for some great headlines. But as Dropbox does its best to eliminate the storage woes of the post-PC era, it may also create new headaches when it comes to storing more of our lives in the cloud. It’s easy to see what Dropbox is trying to accomplish. The company wants to make sure you never have to worry about whether you saved your work on your iPhone, Nexus 7, or Windows PC—similar to what Microsoft is trying to do with SkyDrive, but extending beyond the Windows ecosystem. With Dropbox, your data will always follow you, so you don’t even have to think about it. "We're swiftly heading towards a world where users paying for cloud storage is going to be as common as users paying for a phone bill," says Matthews. "The interesting part is what happens along the way." Dropbox’s existing apps and desktop sync tools are only half of the equation. The new tools for developers are the other half. One of these developer tools is dubbed Datastore, and it’s basically a way for apps to save their data to Dropbox’s servers. An obvious example is gaming: Stop playing a game on your Android phone, and Dropbox could let you resume on an iPad. Datastore could also make sense for drawing apps, task managers, notation apps, and expense managers—anything where working across multiple devices is necessary. Users get an easy way to sync their data through a single online account, and developers don’t have to do as much work. In fairness, other cross-platform options do exist for gaming, but they’re mainly tied to social networks, such as Facebook and Google+. Dropbox has more potential to expand beyond games, and to give users an option that doesn’t require social sign-ins. Dropbox also announced a tool called Drop-ins, which allows app users to save and load their files directly to Dropbox. Whereas Datastore deals with app data, Drop-ins deal with documents, photos, and other files that users might want to access directly, letting you both save and access Dropbox-stored files in-app. Developers can add Drop-ins with just a few lines of code, providing a complete interface for browsing the Dropbox file system. Again, the idea behind a Drop-in is to reduce friction for users. If developers add “choose from” and “save to” buttons to their apps, users may be encouraged to save more files online, making those files available on any other device. The seamless availability that Dropbox promises does sound enticing, but it also comes with its own drawbacks. Of course, there are the obvious concerns, like privacy, security, and reliability. Dropbox has been hacked before, and even accidentally turned off authentication for millions of users in 2011. The service hasn’t been immune to service outages either. And given all that we’ve learned about the NSA and Prism, it’s clear that users can no longer expect complete privacy with their online data. The more data we put online, the more vulnerable we are. But these concerns existed even before the announcement of Dropbox Platform. Anyone who’s deeply worried about the security and privacy of cloud storage probably won’t find much allure in Dropbox to begin with, let alone the additional features that Dropbox Platform will bring. The bigger potential pitfall with letting Dropbox “replace the hard drive” is the headache it could create when you run out of storage. Dropbox has no intention of charging app developers for Dropbox Platform. The company’s business model is the same as it was before: Encourage people to store more data online, so they eventually graduate from free accounts to paid ones. The problem is that cloud storage is a recurring cost. 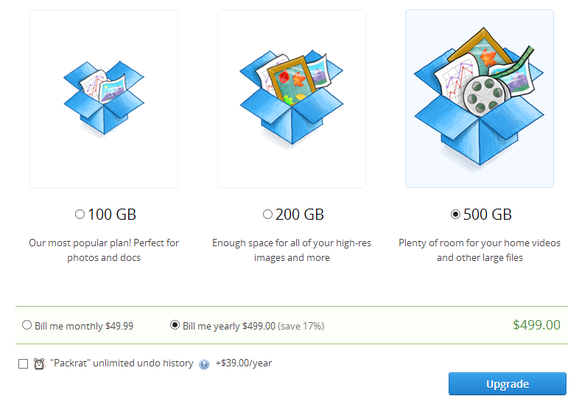 With Dropbox plans starting at $100 per year for 100GB—roughly the same price as a 1TB external hard drive—the jump to a premium plan can really sting. That’s not to mention the added potential cost of mobile data, as you upload more files and exceed your bandwidth cap. In fairness, Datastore isn’t likely to be a major drain on users’ storage allotments. For apps that use it, Dropbox is providing 5MB of save data that doesn’t count against the user. According to Jon Peppers at Hitcents, that’s a pretty generous amount for most apps. But what happens when apps start making it easier to load up your Dropbox storage with all kinds of files, from documents to photos and video? Will users make the leap to paid storage or offload their files to another location, such as another cloud service or a good old-fashioned hard drive? For that matter, what happens when other services like Google Drive follow in Dropbox’s footsteps, and users have to choose between four or five cloud storage options just to use an app? Between dealing with storage limits and juggling multiple services, suddenly cloud storage requires a lot more brainpower. Android, for example, could offer deeper integration with cloud storage services, Matthews said, so users wouldn’t have to sign into their accounts every time they install a new app. Matthews also sees a bigger opportunity for companies like Otixo and Jolicloud, which offer a central hub for users to manage their cloud storage. That kind of service could become more useful as people begin juggling files between multiple storage services. To limit data consumption, Dropbox could provide a way for users to control which types of files get uploaded, and when, Matthews said. Still, none of these solutions sound completely headache-free. We’ll still have to decide where our files go, how often to upload them, and when to shift them elsewhere. And Matthews admitted that paying for cloud storage now seems like an inevitability. “We're swiftly heading towards a world where users paying for cloud storage is going to be as common as users paying for a phone bill. The interesting part is what happens along the way,” he said. Hard drives alone aren't the future, but nor are they relics of the past. That’s not to say the hard drive isn’t becoming more problematic these days. We are increasingly living in a world where juggling multiple devices—phones, tablets, PCs and even TV set-top boxes—is the norm. Relying solely on local storage isn’t the answer, especially when we’re using the same apps across multiple platforms. But like every other overblown claim about the death of something in technology, Dropbox is not poised to replace the hard drive outright. Instead, it will augment local storage, making it easier to move between devices. We may become more reliant on Dropbox than ever, but rather than abandon our hard drives, we must instead consider, literally and figuratively, how much we’re willing to pay for the privilege.